It always takes a little while to get reoriented from being away. When at knitting on Monday (I only stopped by for 15 minutes) I was asked by a coworker how much longer she needed to make scarf she's doing on a deadline, I looked at it and said "it needs to be about 3 times this length." Another knitter present laughed and said "you really should give her good news before you say something like that, you know." Smiling, I laid the incomplete scarf back down on a table and spread it out so I could show how the length would be altered by blocking so she'd understand my estimation and said "I'll buy you some chocolate in a minute, and you're going to need to make this about 3 times longer." That seemed to go down better. Second episode - I went grocery shopping today and got everyone's seasonal favorite CANDY CORN. We all fight like wild dogs over it. Just as we're getting ready to go read before bed, I'm getting the cat some treats and my husband is petting the cat in my arms, feeding him treats. He then goes to the counter and picks up a piece of candy corn. The little one gets all excited and his dad shrugs and pops the candy corn into our son's mouth. Only a millisecond later does the kid realize he's got a cat treat in his mouth. In fairness, according to the little one, cat treats "don't taste like much, actually". As modeled by my mother. Lined with blue velvet. I so hate working on a time deadline. I'll do the sock too. Finally getting a chance to take a decent picture of this stole and post it. The center back panel will have 2 fish, facing opposite ways, when it's done. I also got some feedback from folks who knit here at work. The backing, it needs to be something soft, and dark, so like dark green or black velvet. Sadly, you can bearly see the beads in these pictures. Once it's done, I'll take pictures outside. It's starting to come together for me. Yes, it looks like a "thnead"
I really enjoyed this pattern, hope they work for the auction. 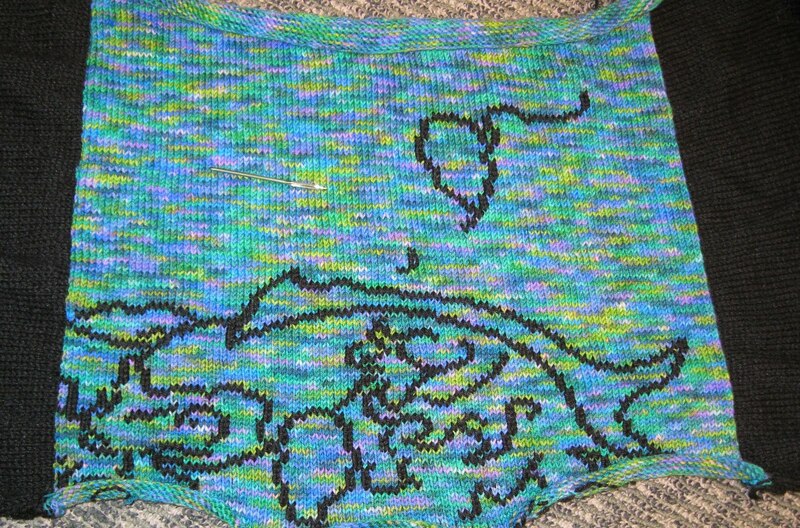 I'm now back to working on the fish shawl for the first auction. We went to the luau at the Polynesian resort. Yesterday we went to Blizzard Beach, today Typhoon Lagoon.